Well I hope the two Lindas don't mind that nearly everyone will combine both the Grungy Monday and the Simon Says Stamp and Show challenges this week as we have a fabulous Tim Holtz 12 tags of Christmas to follow and make a tag at the same time. What luck. To see what techniques were used in the making of this tag, take a look at Tim's tutorial and why not have a go yourself - if you haven't already that is. Stamps - TH - papillon and artful flight; La Blanche leafy flourish; Rubber Stampede text. DIs - worn lipstick, weathered wood, stormy sky, vintage photo. Black, green and burgundy embossing powders. I have the perfect present for this tag and hopefully I will show you some pictures of it - the wedding book project I have been making. I am nearly there. Just a little reminder that there is an 'Anything Goes' theme over at Fashionable Stamping Challenges, unfortunately it hasn't been advertised so we would appreciate anything you could do to get the word out as there are two prizes this fortnight. I hope I will see you there. you really ARE the Queen of tags Brenda - another fabulous piece from you. 4got 2 say - loving ur new profile pic 2!!!! Dear Brenda, your work is oustanding!!! What a unique style you have.I love it!!!! Love your gorgeous project, the dangly charm looks beautiful and what pretty and soft colours you have used for the ageing of the newsprint. I have just treated myself to 6 DI's today, as I only had Walnut and corduroy and I love to see these kind of vintage and eclectic projects. Lovely tag Brenda. Like the text stamp and how you have used it! This tag is very special indeed. 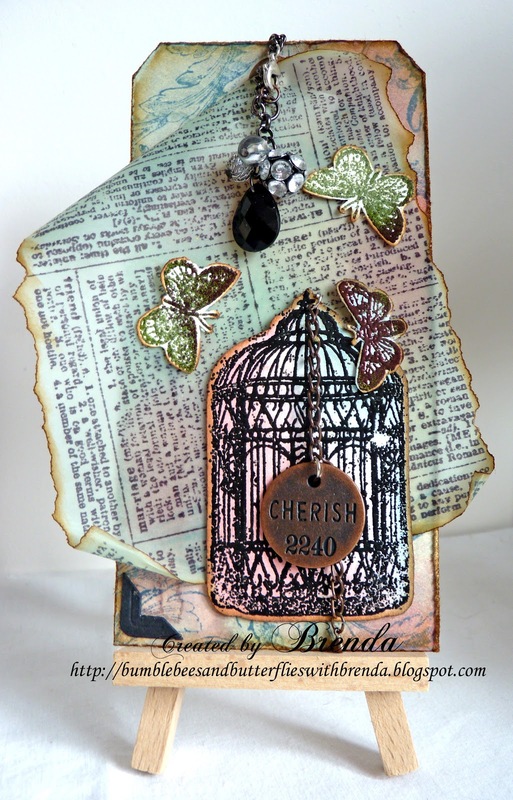 Awesome tag Brenda...love the bird cage and butterflies...pretty papers...I have a Marianne Design bird cage die and must use it...maybe your tag gives me an idea???? Brenda, that's a perfect tag, love all the elements on it. Just gorgeous Brenda. Love the background and the bird cage and butterflies are beautiful. Beautiful tag! I'm going to break out my vellum and give it a try. Thanks for sharing - it's gorgeous! Love the soft colour palette, and the text on the vellum looks great. Brenda, this tag is oh so lovely! The butterflies and birdcage look wonderful on top of the newsprint vellum! Always beautiful! This is stunning! LOve all your incredible details! Ill have to look at that challenge site!